This is something so cute and makes the house smell amazing. As soon as I walk into the kitchen all I can smell is Christmas and here is how to make your very own. Christmas scents of your choice. So we start but melting half of the Soy wax and the Red/Orange wax in the microwave for about 5 minutes, stirring as every minute passes. Whilst this is in the microwave, lay your parchment paper to the baking tray and add the cutter on top. Note the small the surface the better. As the wax will leak through. When the wax is finished melting, add roughly combined 10-14 drops of the scents. I used gingerbread and Christmas Spice. Stir in to add scent to all the wax. Then pour into the cutter. Add your wicks where you would like to place them, mine represents the buttons. Put in the fridge until hardens enough to secure the next layer. Break up the wax thats around the cutter and add this to the other half of the wax along with the colouring again. Repeat step one. Once melted re pour into the cutter. Put in and leave in fridge for a couple of hours. When the candle is ready it will fall out the cutter easily. 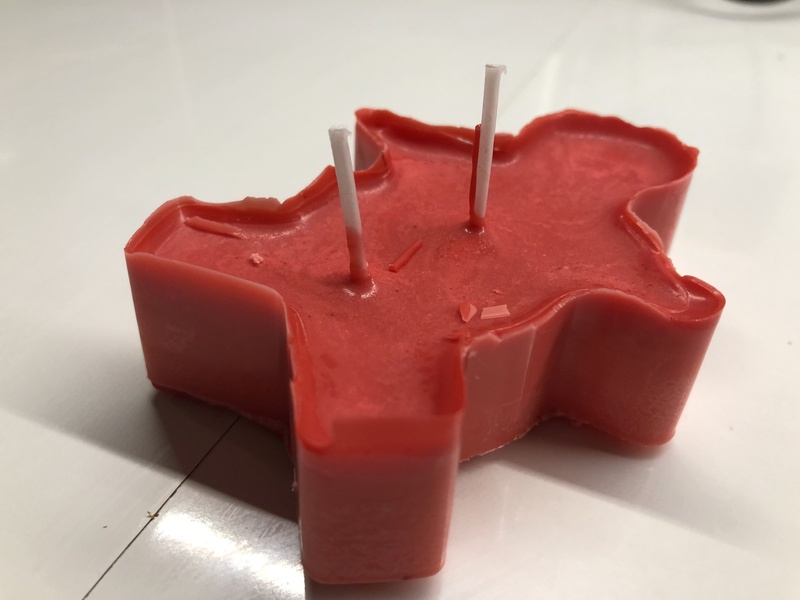 This then makes you a simple easy Christmas candle. A lovely homemade gift as well.